Women in Tech Regatta - Hiding in the Bathroom - SPARK Creations & Company Inc. 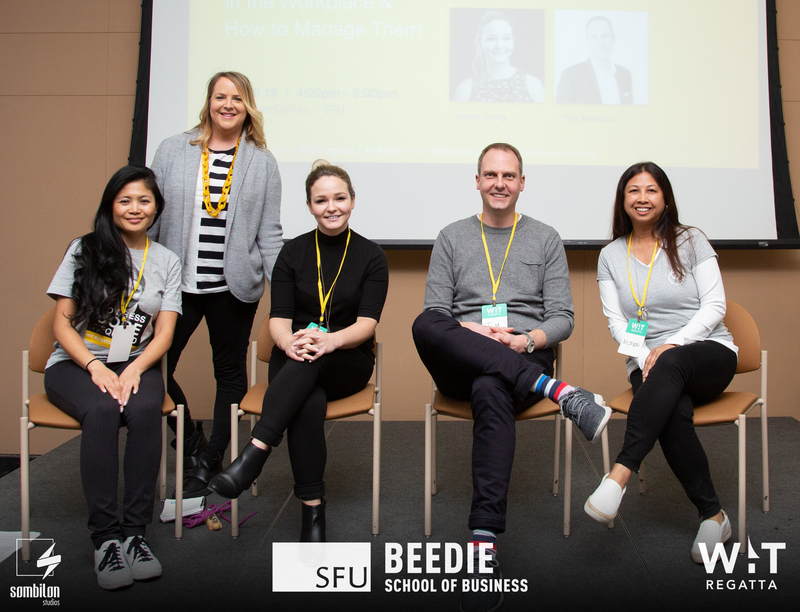 In January, we hosted two panel series “Hiding in the Bathroom” and “Toxic Tech” for the Women in Tech Regatta. A big thank you to Kittima Raksarat for writing the blog post below on her experience at our “Hiding in the Bathroom” panel. When I saw that Lorie Corcuera would be presenting at the WIT Regatta, I knew I had to attend this session. Not only did I really look up to Lorie as a person, this topic is very important to me on a personal level. My entire career, I felt like I needed to prove something to my boss, colleagues, friends and even myself. I was trying to pretend that everything was okay, even if it wasn’t. I felt like if I cried, or even demonstrated any dissatisfaction in my role, that it would be perceived as a weakness, or even as ungrateful. I’ve always been told that I can stay poised and calm in any situation, and I do celebrate that as a strength of mine! I also know that there were moments in my career that I would rely on that trait, to ensure that everyone around me felt comfortable, even if it tore me up inside. It wasn’t until Tim Reitsma came over to my table at the Regatta, that I started to reflect on the changes that I have made, and I realized how interrelated these emotions and experiences are between work and personal life. If you hold your emotions in in the workplace, there’s a good chance that you’re holding your emotions in at home as well. The compounding effect of suppressing my emotions at work, trickled into my personal life. Not to get into details about that, but eventually, it led me to reevaluate who I was trying to be and why I didn’t feel comfortable sharing my feelings. It is becoming more and more apparent that work-life-balance isn’t always a possible reality given the pace of the world we live in. I do think that work and personal lives are starting to blur in that we are more available for work e.g. remote work, easily accessible on your mobile phones, literally anywhere in the world. We need to start thinking about how we nourish our whole self, in all aspects of our lives. That starts with getting comfortable with your own emotions and being able to ask for what you need. I don’t think that we can change corporate cultures overnight, but it does start with a spark – you! At the end of the day, we are still human, with real human emotions which is going to follow with us from home to work. Why not figure out how we can change work culture so that it is more accepting of real humans. Kittima is a seasoned human resource professional with combined recruiting, training, and payroll experience. She has in-depth experience in campus recruitment for professional services firms and searching for accounting and consulting professionals. She is truly passionate about creating authentic connections and guiding individuals to identify their strengths and pursuing exceptional work experiences.